As we prepare to embark on yet another new year, it’s time for us to sit and think about ways we need to improve over the next year. One of the main habits surrendered during this time of year is smoking. The harmful effects of smoking on respiratory and cardiac health are well known, but if you’re a smoker, we want to make sure that you’re aware that smoking can also affect your oral health. In fact, just like it can lead to respiratory and cardiac issues, smoking can be catastrophic to your teeth, gums and mouth. The Centers for Disease Control and Prevention found that nearly half of American adults have, or have had, some type of gum disease. The same study reported that more than 64 percent of smokers suffered from periodontal disease, which is an inflammation of the gums that can lead to the loss of the tissues that hold your teeth in place! The National Institute of Dental and Craniofacial Research has reported that smoking is one of the most significant factors associated with the development of gum disease. Smoking restricts the amount of blood flowing in your gums and surrounding tissues, which increases their chance of being inflamed. When you smoke, your immune system is weakened, leaving your body more vulnerable to infection. Gum disease occurs when the tissue that supports your teeth becomes infected due to plaque buildup. First you get gingivitis, then plaque that eventually hardens into tartar. But your gums aren’t the only thing you need to worry about. Smoking doesn’t just stain your teeth, but it also aids in losing them. The appearance of stained teeth is unpleasant enough on its own. 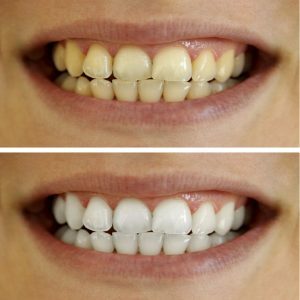 All of the nicotine and tar found in tobacco turns the teeth from their natural white to yellow and eventually to brown. But if this is a habit that you continue with, know that that long-term smoking can result in tooth loss. Having teeth is far more attractive than having a cigarette in your mouth! But there’s more. Smoking will eventually take over lots of areas in your mouth, causing health issues that are far more detrimental than yellowed teeth. Smoking is one of the primary causes of mouth cancer, and it can be fatal. According to the Dental Health Foundation, smoking or chewing tobacco causes between 80 to 90 percent of oral cancers. If that’s not bad enough, even those “I only smoke when I drink” have an underlying issue. Alcohol consumption increases the risk of oral cancer so if one consumes alcohol and tobacco together, the risk is even higher. We are sympathetic to those who struggle with an addiction to tobacco products, but please don’t sacrifice your beautiful smile to the dangers of smoking. If you quit smoking, brush twice a day, floss once a day, eat a well-balanced diet, and attend your regular dental checkups and cleanings, then you will significantly improve your chances of enjoying great oral health.